News in overnight from Whit Kirtland at Bradford Marine Yacht Sales of a $300,000 price cut on the 37.5m flybridge motor yacht Camelot. Boasting an impeccable Dutch pedigree, Camelot was built in 1985 by Royal Huisman to a design by De Vries Lentsch. She had a thorough refit in 2009 to rebuild much of her major equipment, with modern electronic and navigation equipment installed. Accommodation is for 10 guests in a master suite, VIP stateroom, two doubles and a twin while twin 1090hp MTU engines giving her a cruising speed of 14 knots. 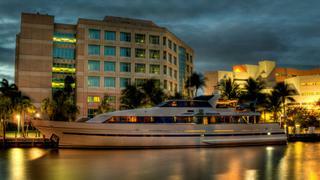 Located at the Bradford Marine facility in Fort Lauderdale, Camelot is now asking $1.495 million.